[fusion_builder_container hundred_percent=”yes” overflow=”visible”][fusion_builder_row][fusion_builder_column type=”1_1″ background_position=”left top” background_color=”” border_size=”” border_color=”” border_style=”solid” spacing=”yes” background_image=”” background_repeat=”no-repeat” padding=”” margin_top=”0px” margin_bottom=”0px” class=”” id=”” animation_type=”” animation_speed=”0.3″ animation_direction=”left” hide_on_mobile=”no” center_content=”no” min_height=”none”][fusion_modal name=”30days” title=”” size=”small” background=”#ffffff” border_color=”#ffffff” show_footer=”no” class=”” id=””][convertkit form=4917537][/fusion_modal][fusion_text]If you read my last post then you know that without a knock-out strategy you are wasting your time on social media. 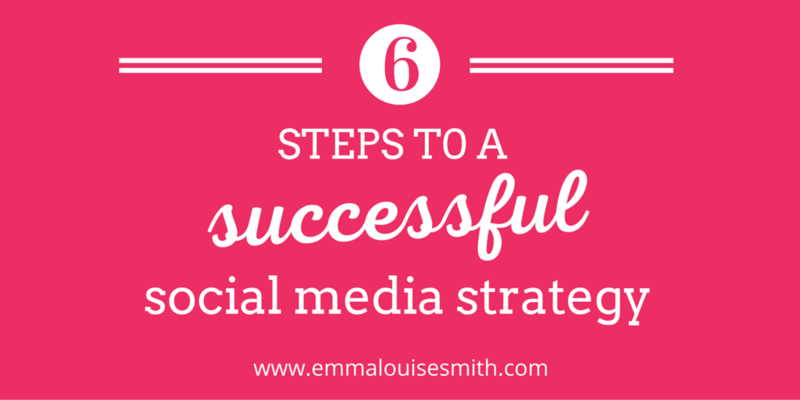 As promised, today I’m going to walk you through the six steps you need to develop your own successful social media strategy – your own roadmap to social media success. Step 1: Get clear about who your audience is. The first step in any marketing strategy is always to be crystal clear about who you’re trying to reach. To do this you need to get into the nitty gritty of exactly who your ideal customer is, what they do, where they live, how they live, what their habits are. You can do this by writing a detailed persona for each of your audiences so that you can use that information to inform decisions about where to post, what to post and when to post. All decisions about your strategy should be made with this audience in mind. The good news is that I’ve made it really easy for you to do this. I’ve written a post all about developing audience personas that includes a [fusion_modal_text_link name=”audiencepersona2″]FREE worksheet[/fusion_modal_text_link]. Step 2: Set measurable objectives. Get clear about what you want to achieve with social media so that you can set objectives based on the metrics that matter most. If you have a marketing strategy, think about how social media can support your aims. If your main aim this month/quarter/year is to boost sales then you need a social media strategy that will send more traffic to your website. If you want to raise awareness about your brand or about a particular issue then you’ll need a strategy that focuses on increasing the reach of your content. And if you’re all about build relationships, perhaps to smooth the path for a new launch then your strategy will need to focus on increasing the number of key influencers that follow your pages. For each of these aims there are specific metrics you can use to measure how successfully you are in reaching these goals. I’ll go into more detail about how to how to do this in my next post. Step 3: Select your most effective channels. A word from the wise here. Be realistic about your time and resources. Yes, it would be great to be on LinkedIn and Instagram as well as Facebook and Twitter, but do you really have the time to do all four well? Done properly, managing 4 channels could take upwards of 15 hours a week. If you’re a one man band I don’t suggest trying to do more than two channels, and if you’re new to social media I’d go as far as to suggest starting with one. Make sure you’re doing that one channel really well before you move on add another. Use the information you’ve gathered in steps 1 and 2 above to select your primary channel – the one that will work best for your business because it reaches the right audience. If it’s also the channel you’re most comfortable with, even better, but it’s reaching the right people that is key here. Then if you you can manage two channels, identify your secondary channel – again, based on how well it reaches your audience. Set a consistent schedule and use a scheduling tool like Buffer (their basic plan is free) to post regular content every day. Step 4: Start building relationships. Would you walk up to people you’ve never met at a party and start bellowing at them about what you do and why they should buy your new fantastic product? No, I think you probably have more manners than that. So why do so many businesses take this approach on social media? I don’t think many of have realised that social media is different to traditional forms of advertising. Posters, billboards, print and TV ads are a one-sided conversation. Social media is not. You have to think of it as a conversation. So introduce yourself, ask about the other person and what they do, make an effort to understand where they are coming from and how you can help them before launching into your sales patter. What this mean in practical terms is identifying potential customers, and key influencers who may share a similar target audience, and trying to build relationship with them. Make a list of them and start sharing and liking their content. Comment on their posts – make them feel good. By doing this you’re laying the groundwork, and warming them up for your sales messages. Step 5: Develop a content plan. A constant barrage of ‘Look how great we are!/Buy what we’re selling!’ messages gets very boring very quickly. Remember the earlier point about social media being a conversation? Always keep that in mind. Don’t be the bore that only talks about themselves. The person everyone avoids getting cornered by at a party. The content you share on social media needs to be a good balance of your own content and content curated from other sources. Content that will be useful to your audience. So if you’re a gourmet food retailer then useful content to share might be delicious recipes from a celebrity chef, or an article from one of your supplier’s sites about how their source their ingredients. A good balance of content to keep in mind is 25% your own content, 75% content from elsewhere. Remember your influencers/customer groups from Step 4? Keep it really simple by using content curated from from those influencers. Getting likes/comments and shares from those people will help you reach your objectives. And your own content shouldn’t all be sales message either. Only one in ten of your overall posting schedule should be a sales message. Build up your reputation as someone to know like and trust by sharing your blog posts, helpful hints, inspiring quotes – and then hit them with a well crafted sales message. If you’re on Facebook you need to allocate a portion of your advertising budget to ads. Ideally you want to be pushing out one Facebook ad a week in addition to your regular content. Why? Because the way the Facebook algorithm works if you don’t pay for advertising, only to three per cent of your followers will see your posts. If you’re a big brand with 100,000 followers then that might be acceptable, but if you’re only go a few hundred followers, your posts are going to have very little impact. Facebook has to be treated as a low-cost advertising platform. I know that’s hard to accept if you’ve had a business page since the halcyon days of huge organic reach, but those days are gone. Accept it and move on. The good news is that Facebook advertising is the most cost effective form of advertising available to small businesses. It’s highly targeted, you can immediately measure the impact of your campaigns, and you can tweak and adjust as you go. I always suggest to my clients that they shift a portion of any money they’d allocated to traditional advertising over to Facebook. So there you have it. A quick and dirty how to guide for creating your social media strategy. Over the next few weeks I’m going to be delving deeper into some of these steps, starting with setting objectives so o stay tuned. Here’s to social media success.